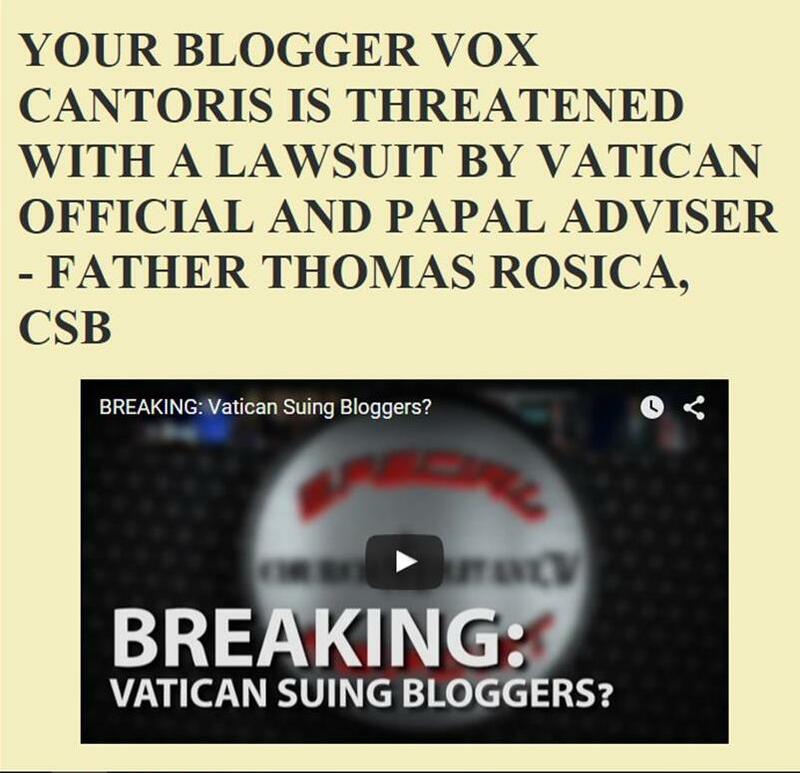 Vox Cantoris: Rosica and Salt + Light sue group of Chinese Catholics! Rosica and Salt + Light sue group of Chinese Catholics! Why is Father Tom Rosica and Salt + Light suing a group of faithful Chinese Canadian Catholics and better still, why are they "Tweeting" it for all to see? Father Tom Rosica is Excecutive Producer of Salt + Light and a Vatican spokesman. Who does this on Twitter? How ugly is this for to air such as this in public! As the Pope caressed the deformed man, he felt only love (so wrote Fr. Rosica on the twitter feed); yet, as Salt and Light sue the Chinese Catholics, what are they to feel? To drag out in public such dirty laundry is disgusting and evil. Another nail in the coffin of S + L. I have maintained and continue to maintain: Fr. Rosica is the millstone at S + L. He needs to go. I was very offended by the action of salt and light tv who is treating the catholic chinese community unfairly， belittling the achievements and dedication of the hundreds of volunteers behind the FLL ministry in the past nine years. This coming from a priest is the more sorrowful and unfortunate，especially one who has such a high profile. I really must admit that I don't understand the outrage I read here. I don't have a dog in this fight because I don't know any of the proponents (I have cable and don't get S&L) but if this involved any other company but Salt & Light would you all have the same reaction? As I read the statement of claim I see a dishonest employee working to the detriment of his employer. If I did the same where I work I would be fired and sued, why should S&L be any different? Does S+L Statement of Claim reflect Judas’s ego act? Everything (trade names, productions, money, donors & volunteers, grace, ability, suffering) belongs to GOD! Everyone is a child of God. Brothers? 1Cor 6:5-6 reminds us “I say this to shame you…not one among you wise enough to be able to settle a case between brothers? But rather brother goes to court against brother, and that before unbelievers?” Did the claimer follow "King Herod" in ordering the massacre of the children of God through the court - for money, fame, power or jealousy? The S+L financial statements in these two years (in web) reflect the truth. For evangelization, for God's love, FLL is not a department of S+L, not the relationship of employer & employee.FLL is not organized just by a few Chinese laity. The essence of its ministry is hundreds of educated and devoted volunteers (most of them have full-time jobs) as well as thousands of donors from Canada, US, and H.K. SINCE 2005, they have selflessly donated their time, money and life FROM God, IN God, WITH God & TO God to produce top notched TV/radio programs for evangelization, funded 100% by donation. Why FLL can be and have to be a registered charity of Chinese Catholic Laity and under the Chinese Parish Council in 2013. God knows who is using evangelization as an end or as a means. I hope S+L can truly understand what Act 5:39 means--But if it comes from God, you will not be able to destroy them, you may even find yourselves fighting against God. I observed that FLL has been passing over this legal shooting with Beatitudes through the grace of God. Wish nobody is under the witch’s spell as in “The Lion, the Witch & the Wardrobe” by C.S Lewis. I would like to invite you to share the joy of remaining in God's love by going into "http://weare.fll.cc/" about the Global Chinese community's sharing of envangelization through the ministry, not a program, "Fountain of Love & Life". John 15:10 states, "If you keep my commandments, you will remain in my love, just as I have kept my Father's commandments and remain in his love." To answer Gabby's question - the outrage was because S+L TV is not an ordinary company and its funds are supposedly used for spreading God's words, not bringing people to court! This coming from a high profile priest is disgraceful and un-Christian. He is running a ministry, not an ordinary company in the business world! Dear Brothers and Sisters in Christ, Are anyone of you casting judgment calls to your fellow brothers and sisters? Including S & L or FLL? It is already sad enough to learn of something within Catholic community as such gone public. Does anyone of you care to sprinkle salt on wounds? I pledge to you all to turn your arguments, debate and accusations to prayers for Peace, Forgiveness and Reconciliation. This is the true spirit of Christmas. May God's Peace and Love be with us all! What I can see is a Catholic organization headed by a super-priest, persecuting an individual Catholic (Paul Yeung - who is known and respected in Toronto as a devoted Catholic who has sacrificed his professional career to devote years of his prime to evangelization work). Persecuting for what? If you look at the Statement of Claim - it's for intellectual property rights of material for evangelization, loss of income (donations?) - all materialistic things ordinary people will fight and die for. Scandalous! Has anyone actually read the claim from Salt and Light? I've not seen the FLL side except for all the talk of being persecuted by S&L. Based on the actions S&L is accusing Paul Yeung of committing , if he did what they say he did, they have a good reason to make a case against him. Father Rosica must have high priced lawyers.....located on Yorkville!! All from the pennies of humble old ladies who donate to that awful network I presume.